Hybrid aortic procedures have the potential to reduce morbidity and mortality in patients that may not be reasonable candidates for traditional open operation. Proposed advantages are: reduced mortality in patients with distal arch pathologies, obviating need for open second stage operation, reduced recurrent nerve injury, reduced bleeding, and pulmonary complications. 1. Hybrid aortic procedures are offered by most aortic centers to find a less-invasive solution for patients with complex aortic pathology. With advances in medical therapy, a growing number of patients in need of aortic surgery have multiple medical co-morbidities and previous aortic operations. 2. We present a patient with four previous open-heart surgeries, who underwent type III hybrid aortic arch replacement with elephant trunk operation followed by endovascular repair for the descending thoracic aorta. 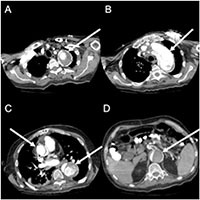 A 60-year-old male presented with chest pain, underwent a CT angiogram in the emergency department, demonstrating a 6.5 cm proximal ascending and transverse aorta and 7.5 cm descending aorta due to chronic aortic dissection (Figure 1,2). His medical co-morbidities included hypertension, previous stroke, coronary artery disease, sick sinus syndrome, cardiomyopathy, and dyslipidemia. His surgical history was positive for four open-heart operations, including: aortic valve replacement, Bentall- Cabrol operation for type A dissection, reoperation for delayed hemorrhage from suture-line pseudoaneurysm, and coronary artery bypass grafting. This extensive surgical history turned out to be life-saving for this patient. The preoperative CT scan also showed a contained rupture of an ascending pseudoaneurysm into the retro-aortic space (Figure 1C). Given his extensive adhesions, he did not develop frank rupture or tamponade physiology and the area of extravasation was contained by previous adhesions. The operative aims for this complex patient were the following: replacing remainder ½ of the ascending aorta, repair of remaining pseudoaneurysm perfusing the posterior Bentall graft (Figure 1C), total arch replacement, and exclusion of false lumen in descending thoracic aorta. It was clear that this operation had to obviate further sternotomies. 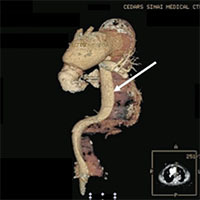 Therefore, a two-stage hybrid procedure was planned with an open surgical part replacing the ascending and transverse aorta and an endovascular approach to complete the elephant trunk in the descending thoracic aorta. The patient had uneventful forth redo-sternotomy and extensive lysis of adhesions. Deep hypothermic circulatory arrest was initiated with antegrade cerebral perfusion through right axillary artery perfusion. The aortic arch was opened and resected. The left carotid artery was used for bilateral antegrade cerebral perfusion, while the left subclavian artery was clamped to reduce steal phenomenon (Figure 4A). The elephant trunk cuff was placed in the proximal descending aorta after a generous surgical fenestration of the septum. Using a 30mm Dacron graft, the distal aortic anastomosis was performed about a cm distal to left subclavian artery and perfusion to lower extremity was initiated through a second arterial cannula and a side-branch. While rewarming the patient, a trifurcated graft was anastomosed to all brachiocephalic vessels (Figure 4B). The ascending pseudoaneurysm was repaired by cutting out the old Dacron graft down to neo-sinotubular junction. Next the trifucated graft was anastomosed to the ascending aorta and the patient was weaned uneventfully off the heart-lung machine. The circulatory arrest time to lower body was 52 minutes, while the operative time was eight hours. The patient was extubated, neurologically intact, next day in the intensive care unit. His postoperative course was complicated by hospital-acquired pneumonia and C. difficile colitis. Due to infection risk, it was decided not to perform the endovascular stage in the same hospital stay, therefore six weeks after his initial operation, he returned for the TEVAR. Bilateral femoral artery access was established percutaneously using ultrasound probe and micropuncture technique. A starter wire was advanced under fluoroscopic guidance and placed through the elephant trunk into the ascending aorta using a Simmons 1 catheter. Subsequent intravascular ultrasound interrogation and angiogram using a pigtail confirmed the anatomy (Figure 5A). 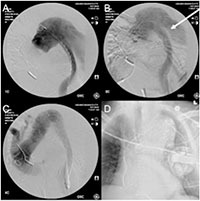 A “bottom-up” stent grafting strategy was chosen given the significant size mismatch between distal landing zone in mid descending thoracic aorta and the ascending aorta. The first and second stent graft (26 x 22mm and 32 x 28mm, Talent Captivia, Medtronic) were placed in the descending thoracic aorta (Figure 5B). Subsequent exclusion of the transverse aorta was performed using a 36 x 36 x 200mm Valiant Captivia (Medtronic) stent graft (Figure 5C). An ascending angiogram and intravascular ultrasound imaging confirmed the successful exclusion of the aorta, with lack of blood flow to the false lumen in entire descending thoracic aorta (Figure 5D). The patient remained hemodynamically stable throughout the operation and was transferred extubated to the intensive care unit. His postoperative course was uneventful. The hybrid procedures are better tolerated and remain an attractive way to restore the aorta in multi-morbid patients with complex aortic pathologies and challenging anatomic and physiologic constrains. With growing experience and newer generation of fenestrated/branched stent grafts and improvements in imaging, TEVAR holds the potential to expand treatment options to include complete endovascular solutions for patients with ascending and transverse aortic pathologies. Figure 1: CT angiogram showing the thoracic aortic aneurysm. A: Aortic arch aneurysm with contrast enhanced true lumen surrounded by thrombus. B: Aortic arch with proximal septum. C: ascending aorta with contained rupture of a pseudoaneurysm in the retro-aortic space. D: Infrarenal abdominal aortic dissection with clotted false lumen. Figure 2: Sagittal slices of the proximal aortic arch aneurysm, and the descending aortic aneurysm with contrast dye enhanced perfusion, and a 90° angulation at the diaphragm level. Figure 3: 3-D reconstruction of the thoracoabdominal aorta with the true lumen (arrow) and the chronic dissection. Figure 4: Intraoperative Image. A: Operative situs after arch resection with antegrade cerebral perfusion (#). Opened descending aorta with dissection membrane (*). B: After trifurcated vascular graft implantation (BT: brachiocephalic trunk, LCA: left coronary artery, LSA: left subclavian artery). Figure 5: Intraoperative angiogram. A: Preoperative angiogram with the pigtail outside of the elephant trunk. B: Aortogram after deployment of the Talent stent grafts with perfused false lumen. C: Completion angiogram with no endoleak. D: Postoperative X-ray of the chest with the stent graft and the AICD. 1. Bavaria J, Milewski RK, Baker J, Moeller P, Szeto W, Pochettino A. Classic hybrid evolving approach to distal arch aneurysms: toward the zone zero solution. J Thorac Cardiovasc Surg. 2010;140(6 Suppl):S77-80; discussion S86-91. 2. Khoynezhad A, Gupta PK, Donayre CE, White RA. Current status of endovascular management of complicated acute type B aortic dissection. Future Cardiology. 2009; 5:581–588.